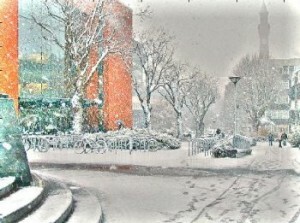 An image of the University of Birmingham School of Computer Science and clock-tower under snow from 2006. The photograph has been pencilised by undergoing some torture by a Matlab script. You are welcome to use this work under a Creative Commons Attribution-ShareAlike 3.0 Unported License.